gorgeous, no? But at $98, a bit out of my price range. 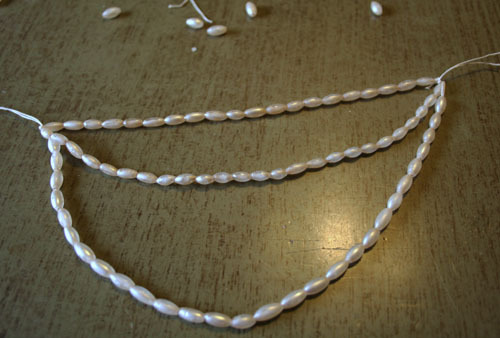 So we're going to attempt to make it using only what I can steal from the dress up trunk and scavenge from the art room - we'll be doing some serious hot gluing and using techniques I'd never use for my sterling jewelry... are you ready? 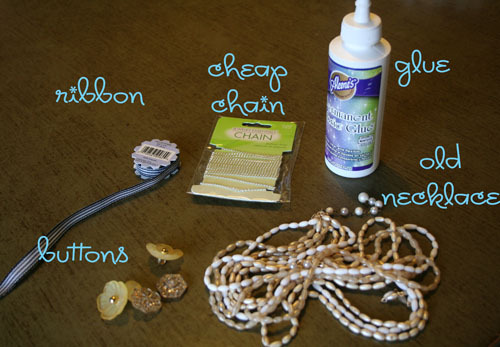 You'll need an old necklace, ribbon, glue, cheap chain from the craft store, buttons or other fun accessories and glue... as with all DIYs I go in blind, not knowing what will work... don't waste time with the fabric glue on this one - pull out your glue gun girls. 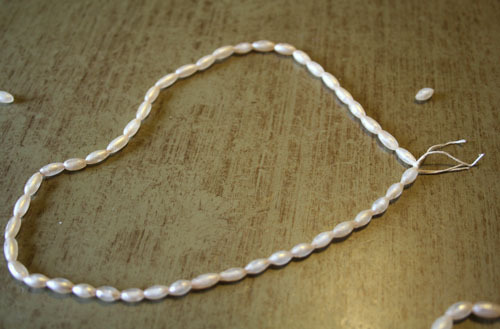 Cut out a bit of your old necklace into two sections. Tie one into a loop. 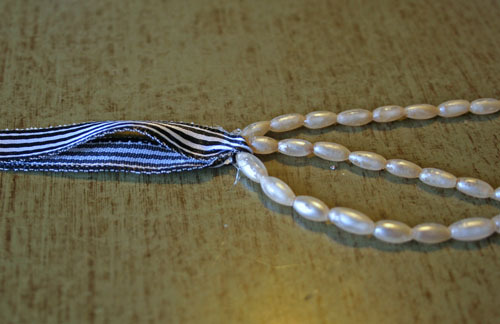 Then tie a longer piece of the necklace to your loop. Take a long piece of ribbon (about 20" long) and double it up. Hot glue the beads to the inside of the ribbon. Repeat on the other side. 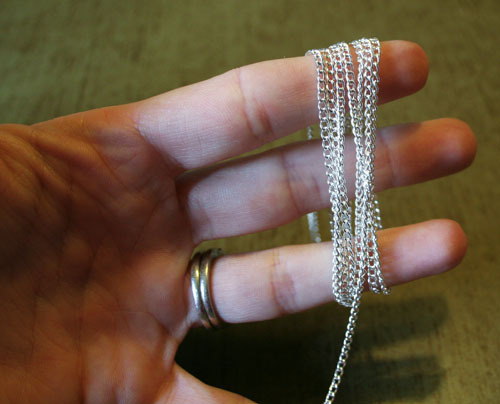 Next take your chain and wrap it around your fingers to make loops (I wrapped mine about 5 times). 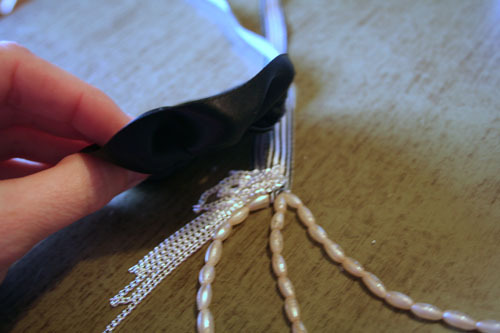 Tie the loops together at the top with a piece of string or wire. 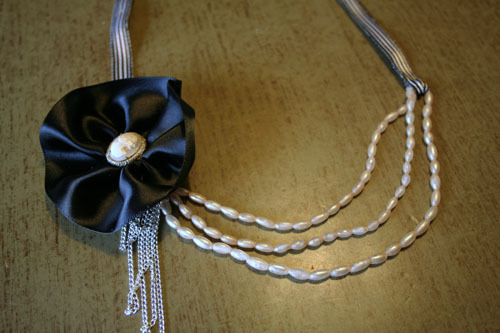 Make yourself a little rosette out of ribbon. 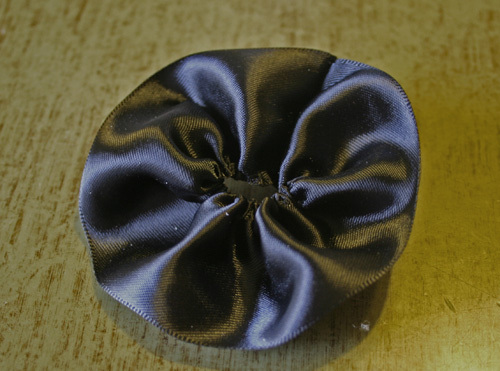 Click here if you don't know how to make a rosette. It's very easy! Hot glue (don't you just LOVE hot glue? me too.) a button on your rosette then glue the whole shabang onto your ribbon so it overlaps with your loopy chain. And your finished. 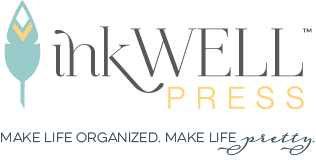 All you need to do now if figure out how long you want your ribbons and cut those off. Make sure to leave them long enough to tie around your neck. See? 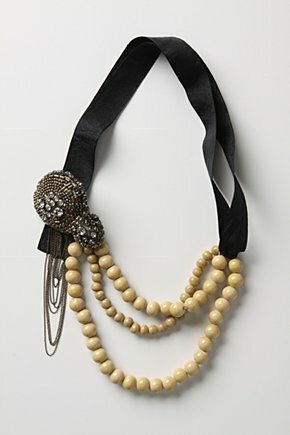 Maybe not as fancy... but it sure does look a lot like the Anthropologie one, right? And this baby cost me less than $2. So, go on raid your kids dress up trunk and see what you can make. I'll be posting more Anthropolifications for the next few weeks! Genius! You inspire me everyday my friend! WOW! That is quite lovely! Wonderful idea. 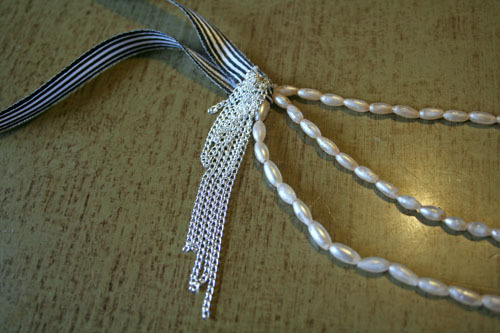 You could make one to match any dress- or even a set to match bridesmaids or a wedding party! gorgeous, gorgeous, gorgeous and i love that you did it yourself! where can i purchase patience? Fantastic :) I can't wait to see what you re-make next. 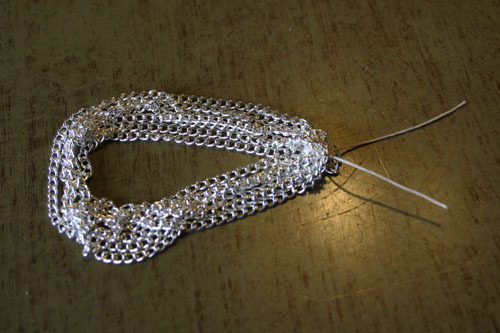 Have you ever tried to make a necklace in the style of 'Subversive Jewelry'? A bit more complicated..but those sell upwards of 300. This is really cool. I never though of making it to look like what you see in the store.